The Revelation 12 Sign: Is It Really Astrology? 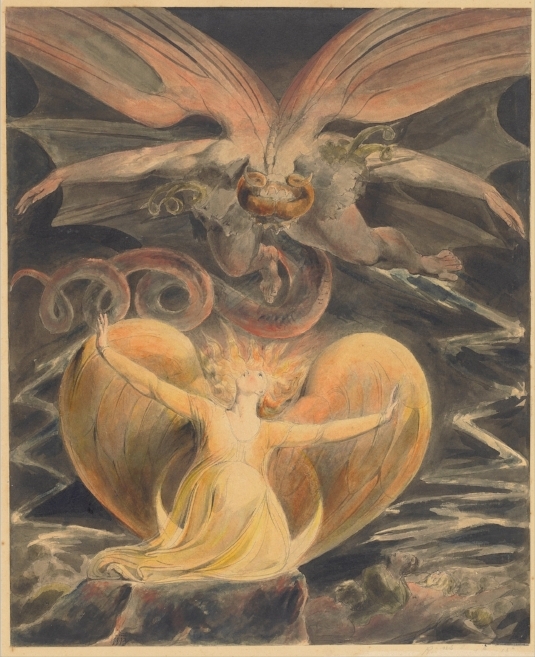 The Great Red Dragon and the Woman Clothed with the Sun by William Blake. As many of my readers are probably well aware, I’m not a Christian. I’m going to assume that most of my readers probably aren’t either. But, to be respectful here, I’m not going to make any attempt to denounce Christianity in this article. My spiritual and philosophical views are rather varied, and my own personal “beliefs” (if you want to call them that) reflect a synthesis of many things that work for me personally, which means that organized religion doesn’t work for me. Naturally, that conflicts with many of the beliefs of Christianity. I’m also an astrologer, but that doesn’t really conflict with Christianity entirely. Actually, there are Christian astrologers (and they’re good at what they do). I want to make it clear that I don’t believe in a lot of things that Christians believe, but I don’t think that’s a problem in discussing the legitimacy of the popular “Revelation 12 sign” and I think that many rational people within the Christian community will agree with me on many points in this article. Also, this article isn’t my attempt to make anyone look stupid, or to dissuade anyone from believing in the prophetic context of The Book of Revelation (Revelation) or the spiritual significance of the Bible. However, it is my strong conviction that Revelation and the Bible were never intended to be literally interpreted. With that said, the Revelation 12 sign brings up an interesting discussion about astrology and biblical prophecy that needs to be addressed. Also, the Revelation 12 sign is another opportunity for astrologers to better inform the public about what we astrologers actually do because the debunking of the Revelation 12 sign from the scientific and astronomical communities is going to impact the public’s perception of what astrologers do, unfortunately. The Revelation 12 sign is a theory proposing that on September 23, 2017, a certain “alignment” of planets and stars occurring over Jerusalem will signify the beginning of Jacob’s Trouble, also known as the Tribulation Period as outlined in Revelation. This “theory” suggests the literal fulfillment of the prophecy of Revelation, i.e. the rapture and the eventual end of the world. Now, “literal fulfillment” is the important point here. Not all Christians agree on the interpretation of Revelation. For example, historicists look at the book through the broad lens of history. Preterists think that it describes events that happened in the 1st century or during the fall of the Roman empire. And futurist interpretations are really at the root of the Revelation 12 sign theory and suggest that Revelation describes future events. This falls into alignment with a literal or fundamentalist interpretation of biblical passages. However, an idealist or symbolic interpretation (something I would suggest if you take it seriously) looks at Revelation from a metaphoric standpoint. If you study religion, theology, AND occultism, you soon realize the Bible’s esoteric nature. Basically, you could suggest that the Bible is filled with veiled astrological metaphors, which is true, but not the whole picture. You see, the astrology of the Bible is not really astrology as we understand it today, but rather something called astrotheology. Horoscopic astrology and astrotheology are quite different, as is the difference between alchemy and modern day chemistry. Astrotheology is more congruent with shamanism and mysticism and was an integral aspect of many ancient, religious cults. A rigorous discussion of this subject is beyond the scope of this article. There are many books on this subject and if you’re interested, I’d strongly suggest researching this. 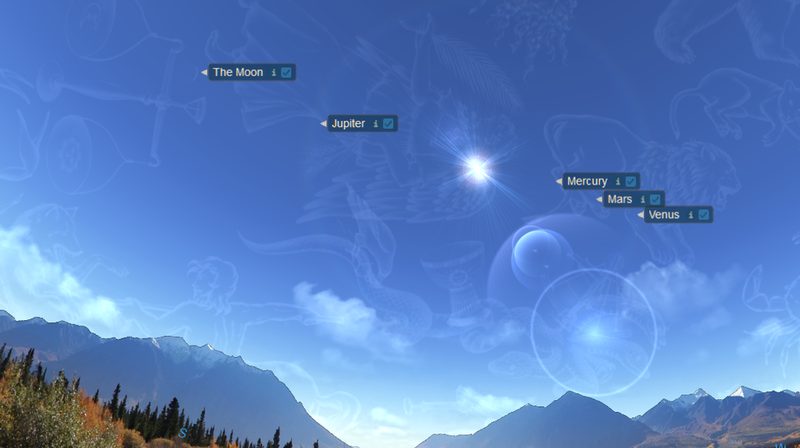 An image of "The Revelation 12 Sign" on September 23, 2017 using Starry Night software. On September 23, just after the equinox and the New Moon, proponents of the Revelation 12 sign suggest that this prophecy from Revelation will literally happen as an alignment of planets and stars in the sky. 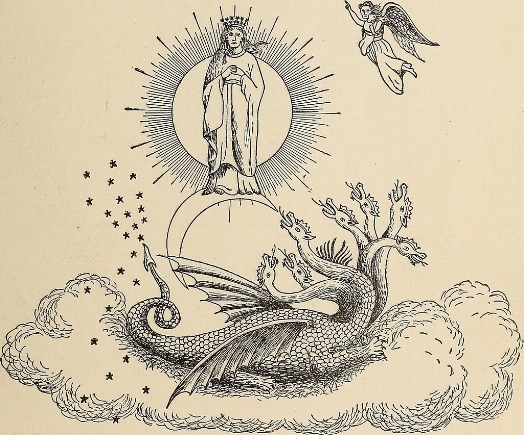 As you can see in the image above, the woman is said to represent the constellation of Virgo; the Sun is at her shoulders (“clothed with the Sun”), the Moon is at her feet, three planets in the constellation Leo (Mercury, Venus, and Mars) are visually “aligned” “above her head” along with nine of the most visible stars in this constellation (making 12 “stars”), and the planet Jupiter is stationing direct near her abdominal area. Jupiter is said to symbolize the male child this woman is giving birth to. The fact that Jupiter is recently stationing direct, which means that it’s shifting from retrograde (an apparent backwards movement through the sky) to direct motion, further reinforces the theory and belief that Jupiter is symbolic of the birth of a child in Virgo’s abdomen, because this retrograde period takes 42 days, which is the approximate period of gestation in the womb. Now, it’s certainly intriguing and this particular setup of planets is quite rare, but let’s get real here. This isn’t the first time this kind of alignment has occurred since Revelation was written. In an article featured on The Catholic Astronomer, astronomer Christopher M. Graney, pointed out that in the last one thousand years, similar configurations have happened at least four times: September 24, 1827, September 6, 1483, September 5, 1293, and September 14, 1056. I’m very grateful for Mr. Graney’s work in finding these past configurations, because I really didn’t have the time or interest to do this myself. You can use an astronomy software program (like Starry Night which I use, or Stellarium) to easily verify these dates for yourself, which I did. While these past configurations are not identical, they’re extremely close and are enough to warrant a validation of this prophecy at those times as well. Maybe the rapture already happened in 1483 and we just haven’t realized it yet? It’s also possible that Revelation, if it has any prophetic or symbolic value, was probably never meant to be taken as a vision of literal future events at all. It’s possible that Revelation, and the Bible itself, are filled with veiled astrological metaphors meant only for those initiates who could decode it and understand the symbolism. It was extremely common for alchemists and initiates of mystery religions and cults to write material coded in esoteric symbolism. This was a way of keeping non-initiates from understanding the true message, cult secrets, and also a way of protecting the secrecy of the cult from persecution. The popularity of the Revelation 12 sign reflects the exoteric understanding of Christianity, and it misses the likely truth that Christianity today is not what it was over two thousand years ago. The same is true of astrology. In fact, astrologers today are just now uncovering the techniques, beliefs, and practices of astrologers who lived thousands of years ago. We’re just now beginning to understand the origin of western astrology. Even with this newfound material, we still barely understand how these ancient astrologers practiced, how they understood time and space, or how they even thought. In light of these discoveries, it’s obvious that early Greco-Roman astrology and the astrotheology of the Bible are not the same thing, by any means. In fact, modern astrologers don’t actually use the constellations. The large majority of astrologers today use either the tropical or sidereal zodiacs. The signs of these zodiacs are named after the constellations, but are not the same thing in a technical sense. The tropical zodiac was already in use long before the Bible was written, and was used in tandem with the sidereal zodiac during the height of Hellenistic astrology during the reign of the Roman empire. When astronomers try to say that your Sun sign is actually the sign before it, they apparently don’t know that western astrologers don’t use the constellations at all, but rather the tropical zodiac, constructed from the Sun’s seasonal cycle. The sidereal zodiac attempts to line up the signs with the constellations, but fails to do so completely because the signs of the sidereal zodiac occur at 30 degree equal increments, while the constellations do not. The constellation of Virgo is 40 degrees wide! The reason astrologers no longer use the constellations is due to something called precession of the equinoxes. This is the gradual shifting of the constellations relative to seasonal points and planetary alignments over a period of thousands of years. For example, roughly two thousand years ago, during the spring equinox in the northern hemisphere, the Sun was in the constellation of Aries, but today it occurs near the end of the constellation of Pisces. This is also where the belief in the astrological ages comes from, and the suggestion that we’re moving into the “Age of Aquarius” since the Sun on the equinox is moving from the constellation Pisces to Aquarius. But, to go back to Revelation 12, I don’t think that this particular passage from the Bible was referring to a specific “alignment” of planets on September 23, 2017. In fact, whenever this configuration occurs, it happens near the Sun, where no one could ever possibly see it! You won’t see any of these planets or stars on Sep. 23. You’ll only see the Sun, and I wouldn’t recommend looking at it (unless you still have some leftover eclipse glasses). From The Book of Revelation ; a study of the last prophetic book of Holy Scripture by Clarence Larkin, 1919. This “great sign” that “appears” in the sky doesn’t actually appear at all. Doesn’t anyone think this is a little suspect? Or did the prophet of Revelation know that two thousand years later we would have the astronomical software to see the “great sign?” I’m thinking probably not. Also, referring to the planets Venus, Mercury, and Mars and the constellation Leo as the “twelve stars” that appear above the woman’s head, is really some serious twisting of the facts to make things fit perfectly. There are actually more than nine stars in Leo. The nine “stars” in the the Revelation 12 sign are the most visible stars in the constellation, but there are several more, as well as above the Virgin’s head that are technically not in Leo. Also, while we know that ancient people may have referred to planets as stars, they actually knew the difference. The word planet is Greek for wanderer, which refers to a star that moves. While they may have thought of planets as “wandering stars”, they knew there was a difference between stars and “wanderers” because they had a word for it. The constellation of Virgo also refers to a virgin! Yes, last time I checked, with the exception of the birth of Christ and Mary’s supposed immaculate conception, virgin’s don’t give birth to children. Okay, that’s not a strong point, but I thought it was kind of funny. The Revelation 12 sign is also somehow tied into the belief in “Planet X” (and a whole host of other viral internet ideologies like the “Flat Earth Theory”). The belief in Planet X originates from the work of Zecharia Sitchin and his many books about the fabled planet “Nibiru”, but particularly his most popular, The Twelfth Planet. According to Sitchin, Nibiru enters the inner solar system periodically, close enough to cause weather changes and massive destruction on Earth. Sitchin primarily made connections between Mesopotamian artifacts to support his thesis that Nibiru is a planet inhabited by a race of extraterrestrial beings called the Annunaki, who descend upon the Earth whenever their planet is in the neighborhood. Sitchin suggested that these aliens actually created the human race, and that the deluge mythologies from Mesopotamia and the bible actually refer to Nibiru. Now, how Christian conspiracy theorists on YouTube are getting caught up in Sitchin's literal interpretations of mesopotamian mythologies is beyond me (unless you decide that the bible is now an account of aliens creating humans). I do think it’s possible that extraterrestrial beings may have interfered with human evolution. Do I whole-heartedly believe that? No. But I’m not going to dismiss that as a possibility. It’s plausible, and it’s an interesting hypothesis. Also, there is much credence to a Planet X. In fact, astronomers are still looking for a large planet, known as Planet Nine, that’s creating gravitational anomalies in the Extreme Trans Neptunian Objects, but it still remains hypothetical. Could this planet be Nibiru? Is it coming into its cyclic passage through the solar system creating havoc and destruction on the planet? I doubt it. And if Nibiru actually does exist, is it inhabited by a race of extraterrestrial beings? I’m going to say, probably not. These are all fascinating ideas and speculations, and they make for great works of fiction, but there just isn’t enough evidence to convince me of their actual validity (and I’ve actually read all of Sitchin's books). The hypothosized orbit of Planet Nine; image via Wikimedia Commons. So, why would anyone believe in the Revelation 12 sign or the planet Nibiru? Why do people periodically get swept up in paranoid fantasies about the end of the world? If you go back through history, especially since the writing of Revelation, these kinds of predictions and speculations have been going on for a very long time. It’s nothing new. I mean, let’s go back to medieval Europe during the bubonic plague and imagine what they thought was happening as they watched everyone around them dying (with Revelation probably at the forefront of their minds). The Revelation 12 sign is not really that unique. As we have seen, it’s happened before. I think that these reactions are a natural response to uncertainty and change. We’re living in a world and society that’s becoming increasingly complex and fast paced. Everything is changing, and rapidly. Technological progress and scientific understanding are happening at an increasingly faster rate. We’re living in a period of human evolution that’s probably never happened before, and if it has, we have no record of it. As a result of this increasing complexity and advancement, people get scared. They want to have some sense of control over what’s happening. It’s possible that what’s happening in the world, for the most part, is beyond our control. For astrologers, we look at a world possessed by mythology. I believe that these myths have power and that they influence people on a very real, psychological dimension. I also think that the Christian mythology is important, and it’s influenced all aspects of our culture, even within the institutions of scientific skepticism. Again, that’s a lengthy conversation, but I point that out because I don’t think anyone is immune to myth even if they don’t believe in a literal battle of “good versus evil”. That battle is still being waged within the unconscious of all people influenced by western culture. I think that humanity is in a process of awakening. To me, this process is endless, because it is the process of evolution itself. As we awaken, we realize the vast complexity of reality, and at each stage, we have varying reactions to that. Here in the U.S., the current political establishment appeals to a percentage of the population that wants to revert back to a more simplistic period of American history. We’re seeing this trend not just in the United States, but across the world. For an astrologer, this appears to be an archetypal inundation within the collective consciousness, and understanding it objectively helps us keep some distance from being taken over by it. But the solution to what’s happening in the world lies at the heart of evolution: adaptation. I think that humans have survived some extremely difficult situations throughout our time here. Given the advancements in science and technology, I think we’re more equipped to survive now than we have ever been. I think it’s time that we embraced change and chaos, and do what we can to continue our journey here on earth, whatever that looks like. In conclusion, many astronomers (including Mr. Graney mentioned above) go on to debunk astrology along with the Revelation 12 sign. This is unfortunate, because their discussion of astrology is always poorly researched. It’s clear that astronomers don’t study astrology, and therefore are not qualified to make any claims about it. They often use the same rhetoric in their discussions, emphasizing poorly written Sun sign horoscopes, as if those represent the entire field of astrology and those who practice it. This is entirely untrue, and forges a very limited perception of astrology in the public eye. To compare the fanatical beliefs and astrotheological prophecies of the proponents of the Revelation 12 sign with the entire field of horoscopic astrology, is rather absurd. Unfortunately, this is a common trend with astronomers and scientists, who, with their very narrow, ad hoc understanding of astrology, try to “debunk” something they know very little about. To experienced, professional astrologers, who study, research, and practice astrology their entire lives, the Revelation 12 sign is insignificant astrologically speaking, but it’s interesting because it opens a discussion about the Bible and astrotheology as a whole. We could suggest that the believers of the Revelation 12 sign are actually debunking the literal interpretation of the Bible through their unwitting obsession with astrotheology. The myth of Revelation, however, is definitely significant from a symbolic or archetypal perspective, and I think that it’s playing out within each of us, and in the world, whether we believe that or not. That is an entire discussion by itself, but for now, I’ll leave you with this: the world isn’t literally coming to an end. The Sun will be around another 5 billion years, and the Earth will be habitable for at least another billion. A meteor strike or nearby supernova explosion could always happen, and yet the Earth would likely still be here, though we might not. But our demise isn’t the demise of the Earth. It’ll move on with its evolution, so let’s move on with ours. These myths may actually be part of that evolutionary process, and working through them within our own lives and on the world stage, may be a very crucial piece of our human story and evolution here on Earth.